I'm so excited! I entered a recipe contest sponsored by "Made In Oklahoma" foods and our local TV station, KOTV, Channel 6. My entry, Hearty Holiday Sausage Muffins, was chosen as the winner in the "Most Made In Oklahoma Ingredients" category. My recipe was also chosen as the "Top Recipe." Yay! So...on the noon news this past Wednesday, on the segment "Cooking Corner" they made my recipe. It was really cool to hear my name on TV. You can see the recipe and the video of the chef, Kitchen Kimberly, making it at the link below. Here's the recipe. 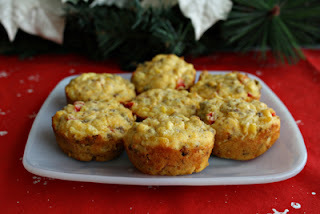 These muffins are great for a Christmas brunch. Oven temperature 375 degrees. Bake 15-19 minutes. Makes 1 1/2 dozen muffins. Thoroughly cook pork sausage in a medium skillet. Drain and set aside. Combine cornmeal, all-purpose flour, baking powder and salt in a medium mixing bowl. Mix together. Add the eggs, sour cream, and butter. Mix until thoroughly combined. The batter will be light and fluffy. Add the corn, cheese, sweet red pepper, and hot pepper sauce. Fill greased muffin tin with batter almost to the top. Bake 15 to 19 minutes, testing for doneness with a toothpick. Remove from oven and let pan sit for 1 minute. Remove muffins from pan. Enjoy! These look delicious and I can see why you won! I found you at Recipes I Can't Wait To Try - so glad I did! These look JUST amazing, I must try them for brunch on Sunday!